La Blanca "Zen Oasis" coverup tunic. Athena "Cabana Willow" coverup tunic/dress in cotton gauze. Split neckline with lace trim. Long sleeves; button cuffs. Relaxed silhouette. Dropped waist. Lace hem. Pullover style. Cotton. Imported. Model's measurements: Height 5'11"/180cm, bust 32"/81cm, waist 25"/64cm, hips 36"/91cm, dress size US 2/4. 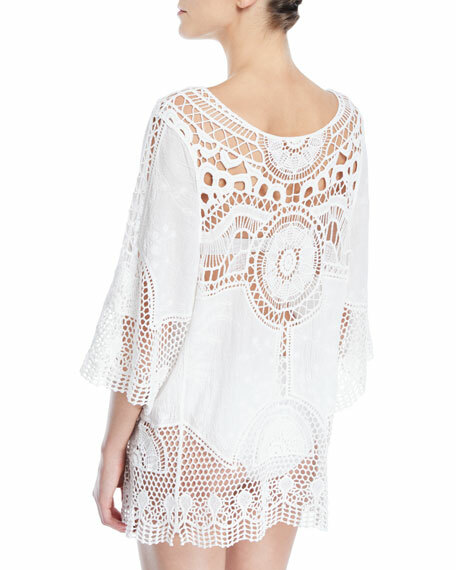 EXCLUSIVELY AT NEIMAN MARCUS Chiara Boni La Petite Robe "Naia" coverup caftan with contrast trim. V neckline. Long sleeves. Easy fit. Maxi length. Slipover style. Silk; combo, nylon/spandex. Made in Italy. Please note: To dress, step into garment rather than pulling it over the head. PilyQ "Joy" lace long coverup. Deep V neckline and back. Sleeveless; thin straps. Floral lace panels. Column silhouette. Self-tie sides. PilyQ "Joy" lace long coverup. Deep V neckline and back. Sleeveless; thin straps. Floral lace panels. Column silhouette. Self-tie sides. Nylon. Imported. Model's measurements: Height 5'10"/177cm, bust 32"/81cm, waist 24.5"/62cm, hips 36"/91cm, dress size US 2/4. PilyQ "Monique" beach coverup with shredded-effect panels and fringe trim. Bateau neckline. Caftan sleeves. Relaxed silhouette. Pullover style. Nylon/spandex. Imported of Italian material. Model's measurements: Height 5'9"/175cm, bust 32"/81cm, waist 24.5"/62cm, hips 34.5"/87cm, dress size US 2.